(L-R) Emma Griffin, Allison Speirs, Irene Leslie, SimpsInns Operations Director, Karen Simpson, owner SimpsInns, and Claire Hajri presenting the cheque at Whiteleys Retreat in Ayr. At the time of year for giving, Irene Leslie and her helpers pulled out all the stops with a Night at the Races at Si! 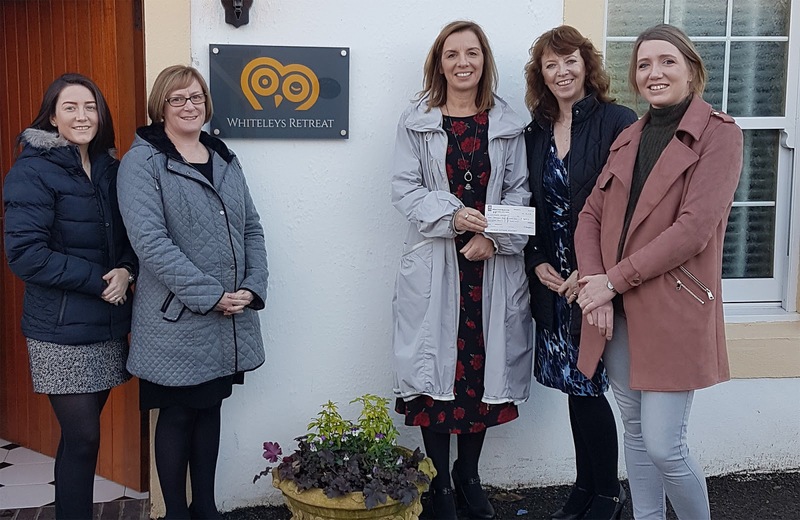 to raise much-needed funds for Whiteleys Retreat in Ayr. Leslie is the Operations Director at the family-owned SimpsInns group and the Kilwinning resident wanted to raise funds for Whiteleys Retreat, who provide “a vital holiday home for children, young people at their families with cancer and other life altering illnesses in the UK”. The team gathered plenty of support to put on a successful Night at the Races at Si! in Irvine. With kind support from all the sponsors, Irene and the team raised £1,458.30. The cheque was handed over today with Irene, SimpsInns owner Karen Simpson, and several other members of the team given a showround at Whiteleys Retreat. “For some time, I had an idea in my head that I wanted to help raise funds for such a worthy cause such as Whiteleys Retreat,” said Leslie. “I then thought, we have these great venues here at SimpsInns, why not try and use then to help raise some funds for charity. The Night at the Races sponsors included; SimpsInns, Taste of Arran, Gymmies Kitchen, The National Trust, Stephen Brown, Marisposa Beauty, Athena Hair, Auchrannie and Eddie Thomson Golf Academy. “I also need to thank the volunteers who did such a great job. There was a great team effort from Karen Haddow, Julie Ann Thomson, Claire Hajri, Dennie Gillespie, Emma Griffin, Laura Gallagher, Janette Mitchell, Taylor McIlwraith and Allison Speirs. “And thanks also to Karen and Malcolm Simpson for use of their venue at Si! and sponsoring the buffet. Thank you everyone for helping towards such a great cause.